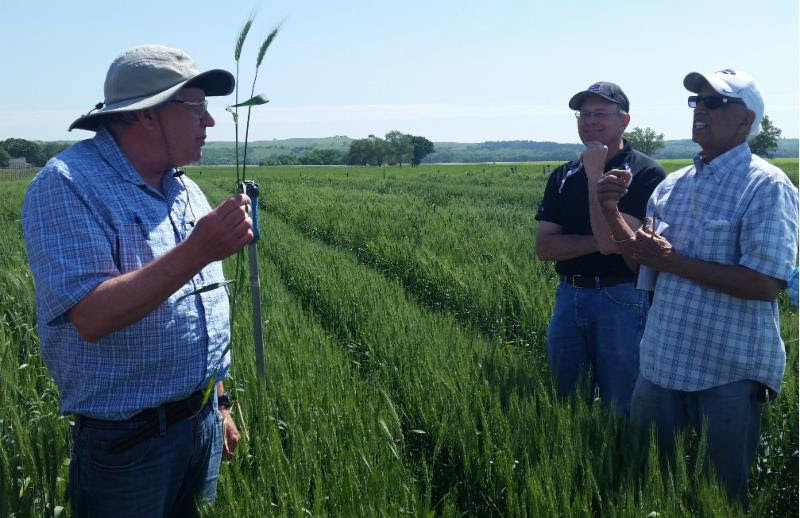 In the months leading up to harvest, many producers, seed dealers and researchers within the wheat industry add one or two plot tours to their busy schedules. There are typically more than 100 plot tours open to the public across the states of Kansas, Oklahoma, Nebraska and Colorado. Although plot tour season has ended, producers are using the information learned during the tours to make planting decisions for this fall. For those who have never attended one, a typical plot tour consists of wheat varieties from various seed companies grown side-by-side to show farmers how the variety grows in the geographic area near them. It’s a way for seed companies to showcase their wheat varieties and for farmers to choose the ones they like best. Dr. Bob Bowden holding up a stem rust infected plant. However, the wheat plot tour hosted by the Wheat Genetics Resource Center (WGRC) is a hidden gem, different from a typical wheat plot. Their field day at the Rocky Ford Experiment Station, off Barnes Road in Manhattan, Kan., offers an approach to plot tours with education at the forefront. The experiment station’s plots are focused around wild wheat species with the goals of harnessing their unique traits for modern day wheat variety improvements and understanding wild wheat genetics. To top it off, the station has been around for 25 years, benefiting farmers in newfound research along the way. Recently, the WGRC held a field day at the station to discuss wheat relatives, germplasm selection for variety improvement, detrimental wheat diseases and more. This gave attendees an up-close view of the different wheat species grown around the world, and what they look like planted in a field in Kansas. The goal is for educational and research purposes, for both researchers and attendees, not to market certain varieties. By going to a field day like this one, attendees got a chance to learn the science behind the crop and about diseases. The field day was led by Duane Wilson, associate scientist in the Kansas State University Department of Plant Pathology, who showed attendees how the WGRC is evaluating wheat plants when a certain disease infects them, the fertility restoration project they are conducting and the relationship of wheat relatives and their genomes. Wilson also showed the group the WGRC nurseries and their designated outbreak evaluations. Some of the different funguses, viruses and diseases looked at included Barley Yellow Dwarf, leaf rust, powdery mildew, wheat scab, stem rust, tan spot and Wheat Streak Mosaic Virus, to name few. There is distinct diversity in the plots that’s hard to miss. The field day allowed attendees to look and learn about the research being conducted at different stations. With each station, notable speakers talked about the research in the nurseries. Dr. Bikram S. Gill, director emeritus of the WGRC and honorary distinguished professor of plant pathology; Dr. Bob Bowden, supervisory research plant pathologist with the USDA Agriculture Research Service and adjunct professor; Dr. Bernd Friebe, research professor in the department of Plant Pathology; Mark Davis, senior scientist in the department of Plant Pathology at K-State; and Jon Raupp, senior scientist for the Wheat Genetics Resource Center also spoke at the field day. If you’re interested in the wild, unfamiliar side of wheat, a plot tour like this will give you the feel of a plot tour, with an educational side. If you missed it this year, you have a chance to attend next year and learn about the projects being researched at the station. Although plots tours for the 2018 season have ended, you can learn more about the WGRC at https://www.k-state.edu/wgrc/. To stay connected with Kansas Wheat Alliance and upcoming news, visit our website at http://kswheatalliance.org/.